Fully Automatic Reciprocating Leaflet Outserter Capable Of 60 Cycles Per Minute. Pre Folded Leaflet Size: (Width) 2" – 7" (Height) 2" – 9". Is Equipped With (2) Head Reciprocating Arm, Auto Index & Electric Eye. & Glue System. Capable Of 1 Or 2 Lanes. Last Used To Apply Leaflets To Top Of Pharmaceutical Bottles. MGS Model Topsorter ll, high speed, 4 head rotary, pick and place coupon feeder rated from 40 to 240 cycles per minute with timing screw – depending on materials and application. Product size range: 1.12" to 2" in Width; 1.12" to 2" in Height and .06" to .75" thick with 4 heads. Equipped with 36" long x 1-3/4" wide x 1" high single coupon magazine, 4-head rotary vacuum suction cup pick n place, 24" long worm screw, Nordson Problue hot melt glue system, vacuum pump, with seko guages and is hand crank adjustable. Control panel has A/B controller and A/B Panelview with on and e-stop push button controls. Mounted on "H" style base frame with safety guarding, casters and leveling legs. Pick and place coupon feeder, rated to 60 cycles per minute. Equipped with two 30"L x 1"H x 1 1/2"W magazines. Label size range to 1" x 6". Will accept a variety of materials from single sheet paper stock to packets. Equipped with 2 up outserter & glue wheels. Made to mount against an exsisting conveyor. 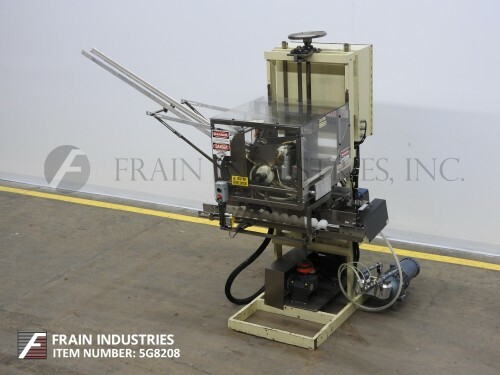 Thiele, Model T7600, high speed rotary pick and place feeder. Rated from 50 – 600 placements per minute – depending on materials, application and machine configuration. 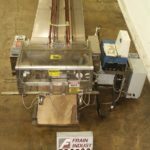 Equipped with a 3¼" wide x 150" long Delrin style conveyor powered by a ½ hp drive, 32" long timing screw, 76" long single belt powered magazine, (6) head rotary pick and place, Piab vacuum system and reject station. Control panel with an AB PLC and touch screen display. Thiele, automatic, rotary feeder and hot glue system. Rated from 10 to 400 picks per minute – depending on materials, application and machine configuration. Product size: 1½" to 8" in Length; 1½" to 10" in Width. 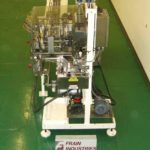 Equipped with 52" long magazine, with (4) head, rotary vacuum suction cup pick n place, Nordson hot melt system, worm screw feed, safety guarding, vacuum pump and motor drive. Control switches for vacuum on / off, glue on / off and push button start / stop / manual glue. Mounted on "H" style base frame. MGS Model RPP-421 Rotary Pick N’ Place leaflet inserter. Up to 600 cycles per minute, product size range 26mm x 26mm, max. product height 102mm. Equipped with 4-head outsert feeder with dual suction cups. PIAB vacuum system, 66"L magazine with vertical screw magazine adjustment, single column clamp adjust style stand with leveling screws and pads. 2-head rotary hot melt outserter capable of up to 100 cycles per minute. Product size: (1 1/2" – 6") x (1 1/2" – 8"). Features 3 1/2"L pick & place arms, 27"L worm screw in feed, 36"L product magazine, (40" – 52") high product placement, sensor for presence, Equipped with Nordson hot melt glue system, Nordson time interval control, hand crank for height adjustment, barrier guarding with electrical interlocks, and sensor for container presence. Mounted on painted steel frame with casters. Designed to be mounted above conveyor. Automatic, hot melt glue, reciprocating, horizontal cam motion, placer capable of up to 60 cycles per minute. Product: (2" – 7")L x (2" – 4")W. Features 6" long single-cup vacuum pick & place arm, 42"H product placement, 3 foot 30-degree from horizontal adjustable product hopper, missing item detection system, vacuum system with manual motor starter, and pneumatic positioner below placing arm. Equipped with DataLogic DL PMC80 series push button controller, Nordson hot melt system, Nordson time interval control, status indicator lights, and barrier guarding. Mounted on a mild steel two column stand. Automatic intermittent motion pick and place coupon feeder, capable of up to 70 cycles per minute for horizontal placements and 100 cycles per minute for vertical placements. Label size range in inches per magazine: Min-1" x 1", Max- 6" x 6". Equipped with Nordson 3100 dual hot melt glue system. 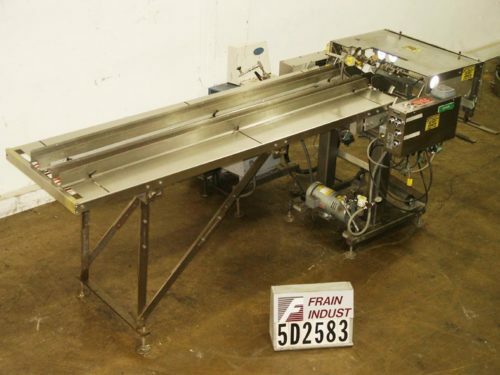 Unit designed to automatically pick product from magazine and place horizontally on a conveyor. Will accept a variety of materials from single sheet paper stock to trays and packets. Automatic outserter capable of up to 60 cycles per minute – depending on material, application and machine configuration. Equipped with Nordson 3100 hot glue system, no box/no apply sensor, Direct Logic Digital 105 PLC and push button start/stop with E-stop.